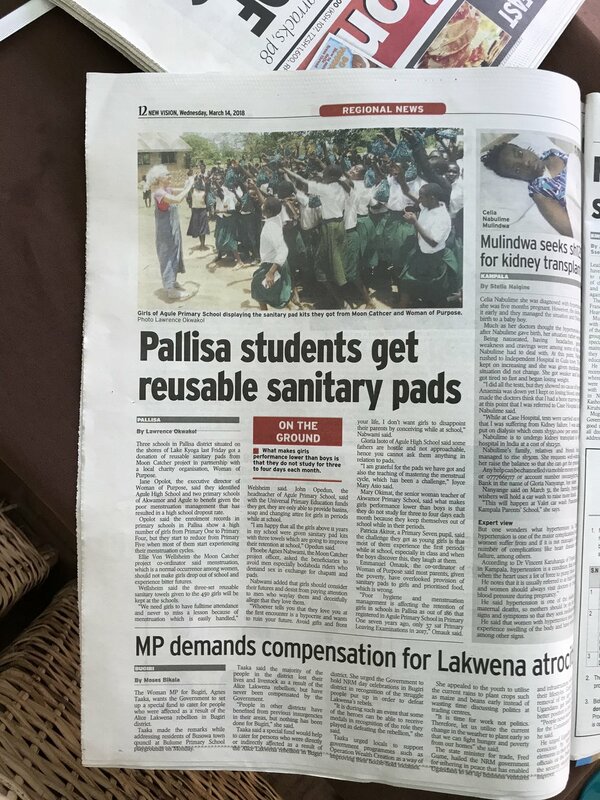 Thanks to all who made Menstrual Hygiene Day 2018 a big success. You helped us reach our goal of raising $10,000 to provide kits to 2,000 girls! We made it! This May the MoonCatcher Project joined hundreds of organizations across the globe to participate in International Menstrual Hygiene Day (MH Day) 2018. MH Day was designed to break the silence and build awareness about the fundamental role that good menstrual hygiene management plays in enabling women and girls to reach their full potential. In a world where menstruation is considered a taboo topic, or even shameful and embarrassing, this global campaign encourages us all to talk about it. MH Day raises awareness of the challenges women and girls worldwide face due to menstruation and highlights solutions that address these challenges. It catalyzes a growing, global movement and supports partnerships at global, regional, national and local levels. MH Day also creates opportunities for advocacy. The MoonCatcher project joined this international effort with our “Let’s Talk About It!” campaign. It is not too late to be part of the “Let’s Talk About It!” campaign. Send us a paragraph or two describing an experience with menstruation! Email your submissions to us. Stories will be posted on our website. During her trip to Uganda, Ellie and the team worked on a new MoonCatcher Project video, sourced local materials, visited schools, made a connection with a Ugandan Rotary Club and even got some media coverage. In Kenya, Ellie worked with our Kenyan partner, Jackie, to develop our sewing cooperative there. And while in Malawi, our team was able to find a very capable young woman – Mary - to act as the MoonCatcher representative there. Mary Khumbanyisa our partner in Malawi shows the new charcoal iron recently purchased for the cooperative. Our Ugandan Partner, Phoebe Nabwami sources local fabric for MoonCatcher Kits. Some publicity for the MoonCatcher Project appeared in this Ugandan newspaper during our delegation visit in March. On March 23 over 70 MoonCatcher supporters showed up to wish Ellie a “Happy Birthday” – and we collected over 400 boxes of menstrual hygiene supplies for local shelters. Thanks to everyone who participated! Did you know that our grant-writing committee has been hard at work? Recently we were notified that the MoonCatcher Project will receive $10,000 from the International Foundation, $2,500 from the Henry E. Niles Foundation and $2,500 from Nordlys Foundation located in Saratoga Springs. Over the month of May, the MoonCatcher Project hosted six MoonBees and produced nearly 1,000 kits. Thanks to the many volunteers who made this possible! Thanks also to our hosts: The University at Albany Interfaith Center, the Queensbury Unitarian Church, the Jewish Federation of Northeastern New York, the Macedonia Baptist Church, the Delta Kappa Gamma Sorority of Maryland, the NNORC of Albany and the First Congregation Church of Albany. Would you like to host a MoonBee? Learn more about this OR contact us directly at tmp@mooncatcher.org or (518) 310-7710. The MoonCatcher Project starts a new year with tremendous energy and ambition to help more and more girls stay in school by removing barriers related to menstruation. We work in the world’s poorest communities to accomplish this by supplying washable, reusable menstrual pad kits (MoonCatcher Kits) made with less than a half-yard of fabric. We also support girls by providing education in reproductive health and menstrual management. We’re proud to report our progress in this newsletter. And we look forward to ongoing success with your support. We plan to produce and distribute another 5,000 MoonCatcher kits this year. MAKING MOONCATCHER KITS – Members of the Woman With a Purpose Sewing Guild in Wakiso Uganda, sew pad kits. The WWP is the first MCP sewing guild in Africa. The MoonCatcher Project seeks to build program sustainability in countries whose girls we serve. We source equipment and supplies locally wherever possible. Most important of all, we support women in sewing cooperatives to produce MoonCatcher kits and supplies. The strategic plan set by our board calls for opening additional sewing cooperatives this year; we’ll update you on that progress. CONGRESS COMES TO A MOONBEE – U.S. Rep. Paul Tonko displays a completed MoonCatcher Project pad kit, with MCP founder and executive director Ellie von Wellsheim. The MCP hosted four MoonBees in January and February of this year, organizing the energies and skills of more than 50 volunteers. On Martin Luther King Day in Saratoga Springs Library, over 50 volunteers filled the Dutcher Community Room at the public library; three local newspapers reported on the event. Since MCP hosted a MoonBee at Union College in Schenectady, many students have continued to be part of the project by attending MoonBees elsewhere. In fall 2017, incoming Union freshman volunteered as part of their orientation, cutting Tyvek, preparing kits for shipping and developing a spreadsheet for merchandise sales. After a very successful MoonBee at Albany’s Westminster Presbyterian Church on Jan. 27, many of the volunteers who’d sewn all morning then joined in a lively Zumba party! U.S. Rep. Paul Tonko (D-NY 20) attended and spoke at our MoonBee at St. John the Evangelist and St. Joseph Church in Rensselaer, New York. Congressman Tonko got right to work cutting out Tyvek for our waterproof pad carriers. He also expressed support and encouragement for our work, highlighting the need to help women and girls around the world and to volunteer to create change in this fragile time in our history. TEACHING, LEARNING – Ellie von Wellsheim instructs Gorette in sewing a MoonCatcher pad carrier at Woman With a Purpose Sewing Guild in Wakiso, Uganda. Ellie will visit Uganda and Kenya from February 23 to March 19, meeting with two MCP teams. She will return to Africa April 7 to 22, working in Malawi. The first phase of this visit, in Uganda and Kenya, will include shooting video for a documentary. Our video team comprises Ellie’s daughter and MCP board member Pisie Hochheim and Pisie’s partner Tony Oswald. Both are Brooklyn-based videographers and editors whose credits include documentary projects for HBO, Frontline, the Food Channel and Martha Stewart in addition to independent films. They will shoot visits to sewing guilds to update progress and fine-tune production, and to schools to record reproductive health and menstrual management education efforts. This first phase will also include work with focus groups to assess program results, plus research in Kampala on locally sourcing fabrics and other supplies. Teams and operations will change on March 5. MCP board member emeritus Maureen Fernandez arrives to meet Ellie as Pisie and Tony return to Brooklyn with their video footage to begin editing. Maureen and Ellie will visit a refugee settlement camp in Kampala, Uganda at a stone quarry and its vocational “Quarry School” where Father Francis Ssengendo, a Catholic priest, is pastor. Maureen, Ellie and MCP Uganda Director Phoebe Nabwami will help set up a sewing room to produce pads, as part of Father Francis’s school. Traveling into Kenya the MCP team will make its first visit to a newly opened sewing cooperative in Kombewa. Jackie Okoth opened the new cooperative last fall with on-site support and direction by Phoebe Nabwami. As they strive to do everywhere overseas, MCP team members will research the sourcing of equipment and materials locally, this time investigating availability and pricing in Nairobi. In Chuntheche, Malawi, traveling MCP friends Kelly DeLaRocha and Lori Ludlow will join the MCP team to support and refine operations at the MCP sewing cooperative and expand the local sourcing of fabric. The team will also investigate locations and opportunities for additional sewing cooperatives and bring kits to additional schools. Sewing cooperatives produce MoonCatcher kits, which MCP delivers to schools, along with reproductive health and menstrual management education. As on all its international trips, MCP team members will procure beautiful, unusual and rare African crafts, bringing them back for sale at MoonBees and other events to raise funds and support The MoonCatcher Project operations.